I was not expecting to get an Apple Watch Series 4 for Christmas, and so far I have been loving it. 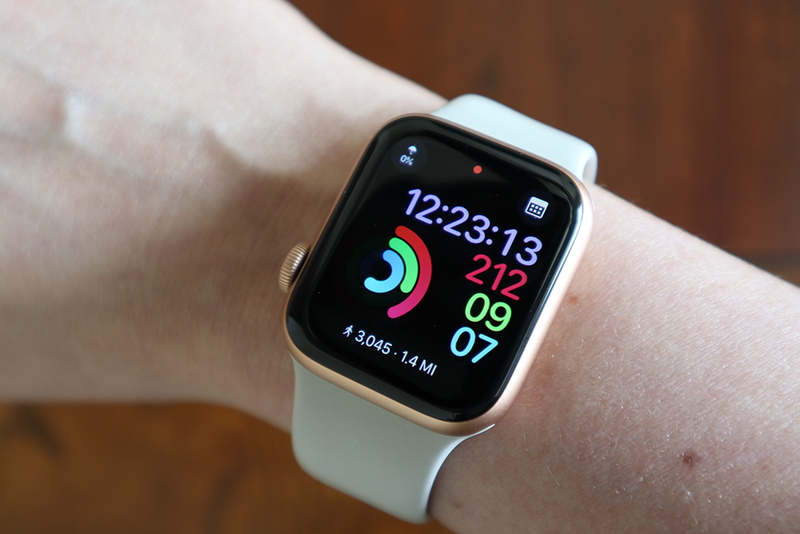 This is my first Apple watch, I’m not upgrading from a previous model, so I have been finding out exactly what the best ways are to utilize my Apple Watch, and I want to share my findings with you. I dug into it right away to figure out the best and most needed apps. Keep reading or watch the video below to find out the 5 top apps I recommend you download right away. An Apple Watch is one of those devices that is such a new concept, it seems like you can go without one. And now that I’ve been trying it out – yes, it’s for sure something you can go without. But there are lots of little benefits and conveniences of having an Apple Watch that I didn’t realize, until I started wearing one. So, let’s talk about those conveniences and which are the best 5 apps to go along with them. I knew I would love the Apple Watch as a major upgrade from my simple Fitbit. With the Fitbit I had, I needed to look at my phone to get the exact amount of steps I had accumulated throughout the day. With the Apple Watch, it does show the steps you have taken, but they are kind of buried in the activity app. To keep me motivated to reach my steps goal, I installed the Pedometer++ app, which has the added benefit of being able to add your actual steps to the watch face. This is the best workaround and even better was that the Pedometer++ app was free to install. Of course, there are all kinds of other health apps pre-installed on the Apple Watch to help you track your workouts and health, but if your focus is on steps every day, then I would recommend this Pedometer++ app, so that your steps are always front and center with a simple glance at your wrist. I make pretty big grocery trips about once a week and I always reference my Grocery IQ app on my phone. Unfortunately, I did not see an Apple Watch app that synced up with Grocery IQ, so I found a different app for free called Shopping List and it is amazing how it just automatically syncs up your list from your phone to your watch or vice versa. Then, you just glance at your watch while you’re shopping, rather than having to keep unlocking your phone, or balancing your phone in the shopping cart, while trying to read the list. This was a convenience I hadn’t thought of until I went shopping with my watch for the first time and now that I have the app that syncs up, it will make those weekly grocery shopping trips that much easier. Do you ever think of things you need to do or add to your grocery list while you’re driving? Well, having the Apple Watch allows you to talk to siri and tell her to set reminders for you. Instead of having to fumble for my purse in the backseat while I’m driving, now I just talk to my watch on my wrist. I use the built in siri app for appointment setting or reminders. But I installed the Just Press Record app to be able to record a long idea or message to myself. You can play it back to yourself on your watch or even send it to your phone. It’s really convenient and much safer than trying to find your phone while you are driving. The Apple Watch does not come with a built in calculator like your phone does. When calculating tips or figuring out the price of something on sale, having a calculator on your wrist is really handy. And it makes you feel like Mr. Gadget or James Bond, and they are both super cool. I downloaded the PCalc Lite app and you can even speak the calculations into your watch instead of typing them in. The numbers are big enough to read, even though I have the smaller watch face, so no trouble with typing the calculations in, it’s just nice to have the option for speaking on there. I don’t use Uber that often, but when I do, I am usually juggling suitcases and my purse with my phone is somewhere on my bag. So, digging around every 3 minutes to see where the Uber is can be a hassle. The Uber app for the watch is VERY simplistic. You actually set up the Uber on your phone and THEN you can put your phone away and keep track of the Uber on your watch. It will give you the number of minutes until your Uber arrives, a photo of the driver, and the license plate, which are all important details when you are disheveled after a long trip, in a new location and just hoping you don’t get into the wrong car! So, those are my top 5 must have apps to download onto your Apple Watch. If you want to see more content on the Apple Watch, leave me a comment below. Thanks for reading and I hope you have a happy day!